SCRANTON, P.A. 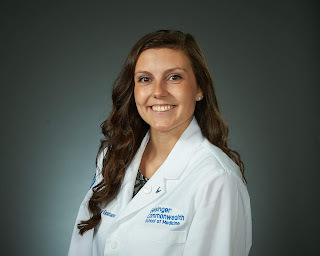 -- Sara Graham of Hamburg and other first-year doctor of medicine (MD) students received the first symbol of their new profession as Geisinger Commonwealth School of Medicine (GCSOM) held its tenth annual White Coat Ceremony for the Class of 2022 on Friday, Aug. 3 in Scranton. At the ceremony, Geisinger Commonwealth's dean, Steven J. Scheinman, M.D., told the students, "Some doctors succumb to the temptation to think of their white coat as a shield, or a barrier, or a status symbol . . . You won't be one of those doctors. You will come to see this white coat not as a symbol of status, but as a reminder that your role is one of service: to the community, and to your patients." Shubhra Shetty, M.D. presented the Dr. Lester Saidman Memorial Lecture, named in honor of the well-respected physician and educator from Luzerne County. Dr. Shetty is regional associate dean and professor of medicine at GCSOM. Her career was greatly affected during her residency training in Brooklyn in the early '90s, when the HIV/AIDS and crack epidemics were at their peak. Her experiences caring for AIDS patients led Dr. Shetty to a career as an infectious disease specialist. She helped establish and serves as medical director of the first Ryan White Clinic in the northeast Pennsylvania region, which serves a seven-county area. The Class of 2021's 113 future doctors participated in a ceremony, held in common with virtually every other medical in the nation, designed to welcome new medical students into the profession. Students recited an oath acknowledging their responsibilities as future physicians and their obligations to future patients. Then they were cloaked with the white coat -- the mantle of the medical profession - by a member of TCMC's faculty. White coats are provided by The Stanley J. Dudrick, M.D., and Alan G. Goldstein Endowed Fund. A reception immediately followed in the lobby of Geisinger Commonwealth's Medical Sciences Building, 525 Pine Street, Scranton. Geisinger Commonwealth School of Medicine (Geisinger Commonwealth) is a member of the Geisinger family. Geisinger Commonwealth offers a community-based model of medical education with campuses in Danville, Doylestown, Scranton, Sayre and Wilkes-Barre. Geisinger Commonwealth offers Doctor of Medicine (MD) and Master of Biomedical Sciences (MBS) degrees. The college's innovative curriculum, focused on caring for people in the context of their lives and their community, attracts the next generation of physicians and scientists from within its 17-county region in northeastern and north central Pennsylvania, as well as from across the state and the nation. Geisinger Commonwealth is committed to non-discrimination in all employment and educational opportunities. Visit www.geisinger.edu/gcsom.